At 5:50 am on Halloween morning I lined up for the start of the Javelina Jundred. My time goal was to complete the 100.9 miles under 20 hours and my physical goal was to manage it better than my first JJ the year before. A couple months before the race I partnered with the USARC program in Big Bear California to raise funds for their great program. 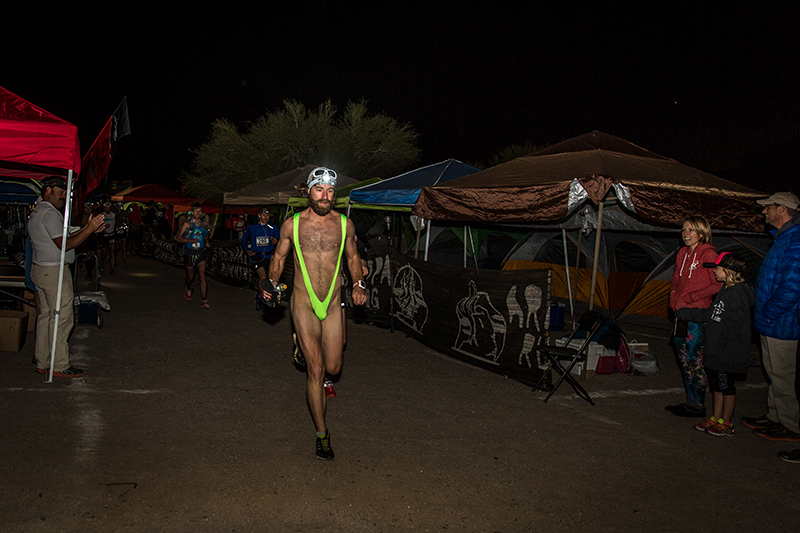 Nothing like adding some extra incentive to finish this race no matter what! The training had gone well. I had built up to many 80 to 100 mile training weeks with long runs up to 40 miles and back to back runs up to 60 miles. I tried hard not to 'over train' but find a good balance of running/recovery with the goal to arrive at the start as close to 100% as possible. 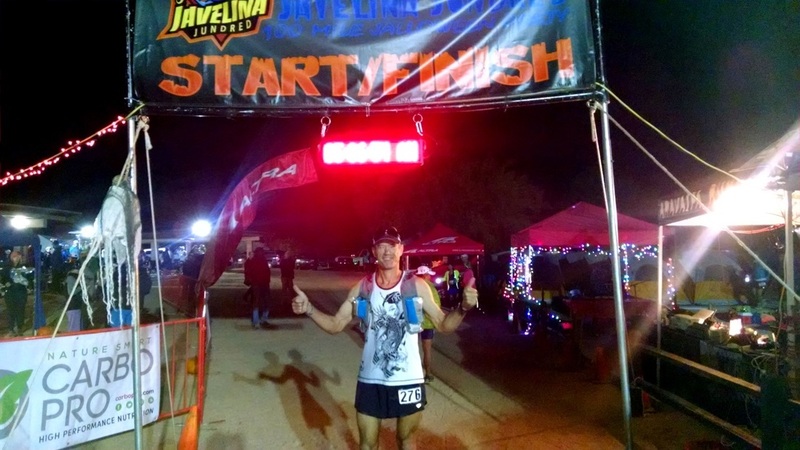 The Javelina is a qualifier for the Western States 100 lottery so finishing was necessary to enter the lottery being held in early December. Floodlights were on at the JJ start/finish area and the DJ music was adding to the party atmosphere. 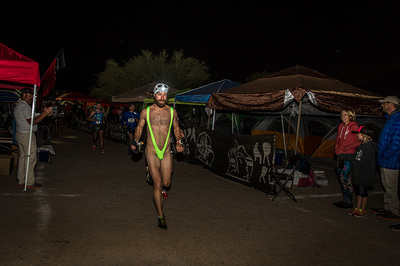 Looking around I saw some familiar faces and quite a few costumes, some just an accessory or two while others were too funny like the runner wearing a lime green Borat mankini swimsuit. So the spirit was festive and lots of smiles as the race director Jamil Coury said some final words and started the countdown. At 6am we were off.. all 459 of us! So I get asked by runners and non-runners alike what it's like to run all day.. what do you eat?.. what do you think about?.. how do you do it? do you get bored?.. how often do you stop? I know it helps that I love to run and being outdoors, moving, covering ground and taking in the scenery.. it makes me happy for the most part. Of course it all depends on how I'm feeling physically at the time. The mental part is easy if the physical part is happy. Throw some blisters, upset stomach, cramps, etc into the mix and the pleasant/happy part goes away. I'll try to give a feel of what it's like for me to run 100 miles. Primarily I wanted to stay in a good comfortable zone for the longest time possible. 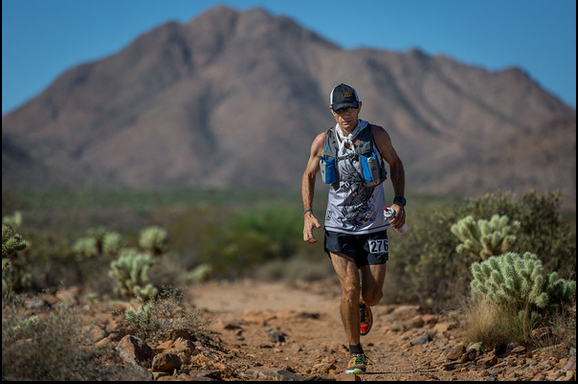 I knew it would get harder at some point and running for 20 hours is going to present some challenges, rough spots and character building moments. 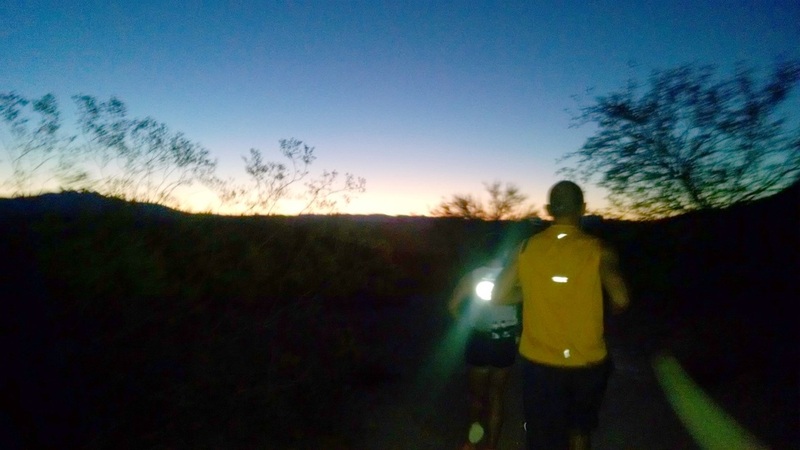 But the first miles were very easy, getting into a rhythm of gentle running in the dark and being careful of the rocks, cactus and other runners. The temperatures were in the mid 50's and it felt great. I knew the cool temps would not last too long so at least wanted to take a little advantage of such nice conditions. 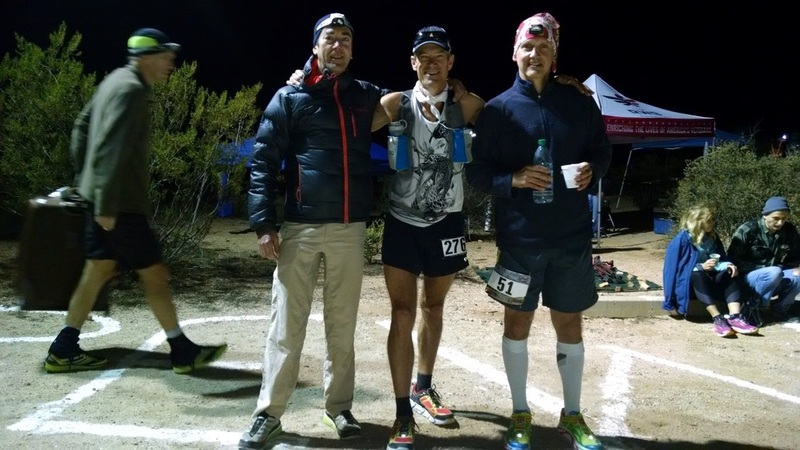 As it continued to get lighter I heard a couple runners chatting behind me and it turns out that I had met one of them, Jimmy Dean Freeman at the Bulldog 50K in August. Jimmy and his friends were good company on the rolling single track. Overall the course is pretty tame with lots of smoother surfaces and gentle ups and downs (about 600 foot climb and descent on each loop). A couple sections are rocky but nothing too extreme so most are able to run these sections. Well during the day anyway, at night things get trickier. 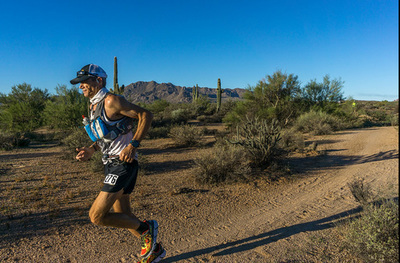 There are four aid stations per loop around the Pemberton Trail: Coyote Camp, Jackass Junction, Rattlesnake Ranch and Javelina Jeadquarters (Start/Finish). 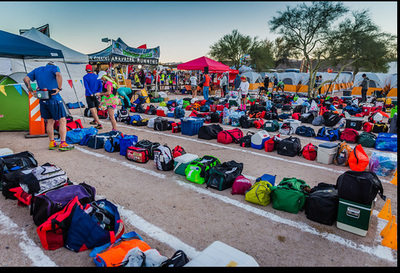 These aid stations are incredibly well stocked with foods and drinks that ultra runners want/need. Several different sport drinks, water/ice, coke, mountain dew, ginger ale, mountain dew, salty snacks, fruit, cookies, candy, sandwiches, soups, potatoes, avocado and on and on. And the folks volunteering were guardian angels.. helping to fill bottles and getting what you need all day and night. I breezed quickly through Jackass Junction with just a topping up of the water bottle and started running with Shaheed. Turns out she was #9 Female at Western States in 2014 and it was nice to pass some miles chatting about her Western States experience and about other courses. The first loop (15.3 miles) took just under 2:15 which comes out to 8:47 pace and 141 average Heart Rate. While at the JJ Jeadquarters I stopped in the designated gear bag area to refuel my bottles. I was 'self crewing' this year which takes a little more time to prepare everything pre-race and accept that it will take more time to fill my own bottles, etc. But I liked the idea of being self-sufficient and using the amazing volunteers at the aid stations for anything else I needed. I also ran into Billy Yang, an ultra runner and film maker in Southern California who was crewing for some friends. He ended up giving me much needed encouragement almost every time I came into and out of JJ Jeadquarters. Each successive loop is run in the opposite direction so it's sort of like an out/back that equals 50K (31 miles). Mentally I liked this type of counting which meant I had to do "just" 3 out/backs and then the additional 9 miles. The second loop was still really smooth running although the heart rate monitor numbers were higher than I wanted. The goal was to stay below 135 for the first half but I was seeing 145 to 150 more often at this time. I slowed things down some which helped and stopped at Jackass Junction to find my drop bag for sport drink powder. The plan was to use a product called Tailwind for as much of the race as possible. This would provide hydration and fueling at the same time. I could tell things were starting to already heat up and I made it a point of adding ice to my bandana and wrapping it around my neck at every aid station during the day. Somewhere on the second loop I cut a corner a little too sharp and brushed a cactus type bush with my thigh. It stung a little and reminded me that I needed to be very careful to give any flora and fauna a wider berth! As I reached 26.2 on the Garmin I noticed a time of 3:59:50. So managed a sub 4 marathon to get things started while the conditions were more ideal. 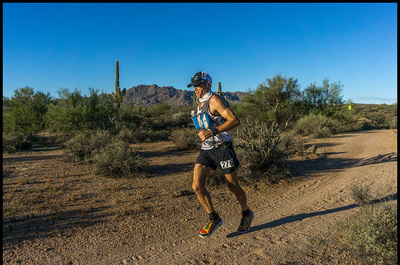 Also on this loop I saw an ultra running friend Dave LaTourette on course taking pictures and crewing for his friend Shawn who was attempting his first 100 miler. Running solo at this point and the iPod was loaded with hundreds of songs.. very eclectic mix covering the gamut of electronica, mariachi, classical, rock, pop, rap and more. I was enjoying watching the leaders and other runners heading in the opposite direction and tied to stay as relaxed as possible and get into an all day type of groove... to make consistent progress over each stretch of the course and stay out of trouble. The third 15.3 mile loop took 2:47:48 (10:58 pace, 148HR) 7:30:54 elapsed time, 45.9 miles .. 1:30 in the afternoon. Heading out on the fourth loop I was reminded that this is where my race fell apart quickly last year. Mile 48 had me light headed, nauseous and cramping badly. So it was nice to get through 48 miles with the legs and head feeling good. But unfortunately it was only 4 miles later that I started to feel some nausea. I continued to run but my stomach was knotting up and I stopped several times to stretch and sit in the shade to see if things would feel better. A fellow runner asked if I was ok and when I said stomach issues he asked if I wanted some ginger chews. I took a couple and continued to rest. I figured it was better to wait until I felt better than to run and make things worse. So eventually I ran slowly the additional mile and made it to Jackass Junction where I drank some ginger ale, experimented with some solid food and laid down for a bit. In all it looks like I spent about 44 minutes of non-running over this two mile section. Or another way to look at it was it put me about 4 miles behind schedule. The good thing was my stomach started to feel better and I was able to get going again. The good thing about coming out of a rough patch is that any small improvement is very encouraging and helps the psyche have a more positive focus as the dark clouds disperse. Unfortunately I had a minor fall in this section. The trail surface was smooth but dipped down for 20 feet before heading back up. At the bottom of the dip hiding in the shadows was a small exposed rock that was like the tip of the iceberg. Didn't notice it at all but I hit it and flew before sliding on the ground. The impact was on my side and rolled some onto my back and came to a sliding stop. I quickly got up and accessed the damage. Mainly just some scrapes along my shoulder and upper arm. 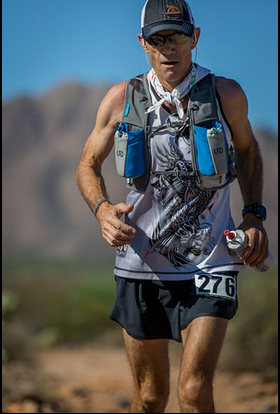 At the next aid station I was able to get some fresh water on my bandana and wash the dirt and blood off. Fortunately it was nothing major. 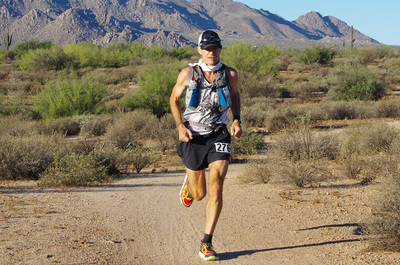 The fourth 15.2 mile loop was 3:40 (14:26 pace, 136 HR) 61.2 mile in 11:11:41 (5:11pm). 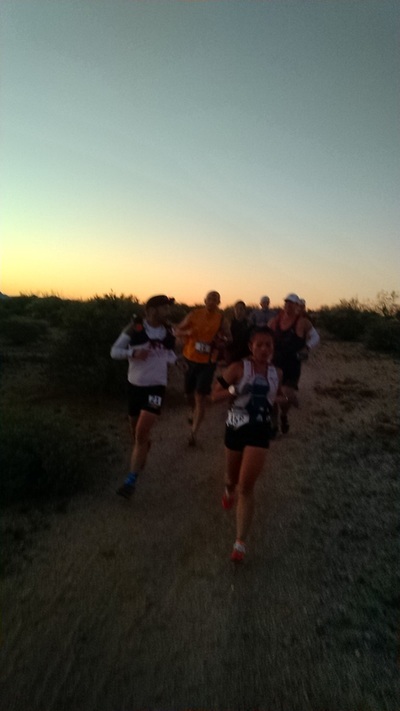 Heading out on loop 5 and the sun was setting. I was looking forward to the cooler temps and had changed my sweaty shirt for a dry one so I wouldn't get too chilled. As you can see from the picture the trail wasn't too crowded here. :) The white tent structure on the right is the Coyote Camp aid station. 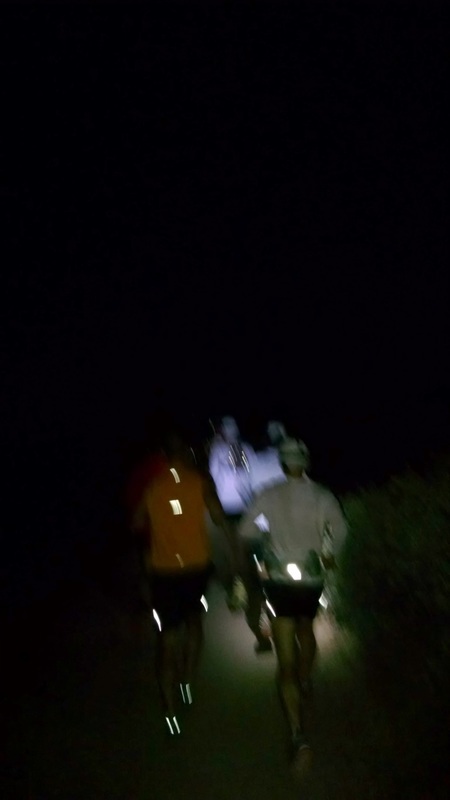 The next loop went pretty well considering much of it was run in the dark with a headlamp but the stomach was behaving. I was using a combination of food and tailwind drink but not sure if I was getting enough nutrition. My pace was slowing but the legs felt good and I continued to run almost all the hills, only walking the roughest rocky sections. Coming into Jackass Junction in the evening was lots of fun. A DJ was cranking the music and the place was a hub of activity with volunteers singing, dancing, helping out and cheering everyone up. As much as I wanted to stay I kept things moving. Mentally I was telling myself that this was the last time doing this out/back. I was feeling better and moving well enough. A bit later on the trail watched a fireworks display in the distance and was told by a volunteer at Rattlesnake Ranch that they were likely from a local casino. 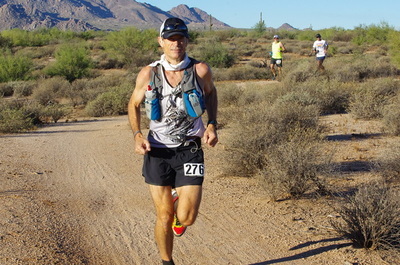 Finished the 5th 15.3 loop in 3:06:36 (12:11 pace, 130HR) 76.5 miles in 14:18:17 (8:18pm). Heading out on the 6th loop my spirits were high. This was the last full loop and the legs felt good. The Garmin 920 had died but I had a Garmin 620 as backup. But soon into this loop I started to feel the nausea return. It forced me to walk some sections and try to get things under control. I stopped turned off my light and took in all the stars. 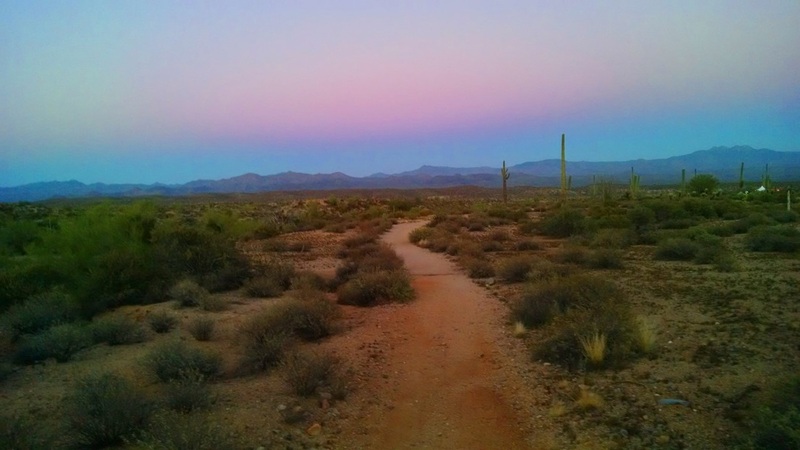 The desert sky was amazing and witnessed a meteor shower during my short break. Continued on for several miles and made it to Jackass Junction feeling really nauseated. Went off to one side to throw up but not much would come up. I started to break out in a cold sweat so laid down to reset my body. Now it was getting colder in this particular area so made my way over to the medical tent which was heated and took a few antacids. Ended up spending about 30 minutes at Jackass Junction and decided to head back out. I knew I only had 18 miles to go. So the next few miles were slow but eventually the nausea went away and I was able to run consistently and feel better. Out for the final 9 mile loop and I was motivated to make some time back and see how close to 20 hours I could make it. I ran slowly but steadily into the early hours of Sunday morning. Fatigue was now my constant companion and caffeinated soft drinks seemed to help keep her from taking over. 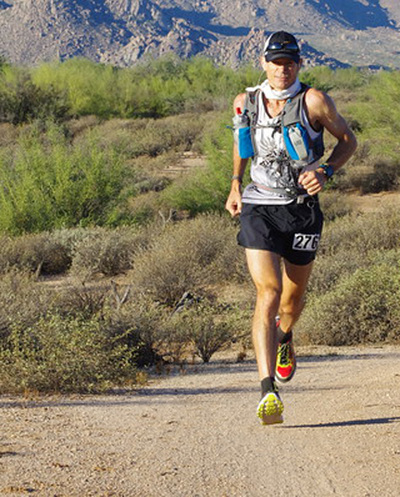 For the final loop you are given a glow ring around the neck that is your admittance to the Tonto Tank trail that cuts the loop to the finish. It felt good to get some encouragement from the other runners who could see you were on the last stretch of the course. I started to catch up and pass some of the others wearing 'rings of fire'. Most had pacers and most were walking the uphill sections at this time. I walked one section with a guy who said he just didn't have anything left for the final 10 miles and wanted to know how much we had to the finish. That was at about 5 miles to go. I overtook 6 runners from mile 91 to 96. The trail turned downhill and was nice and smooth. My headlamp didn't seem as bright anymore (or maybe it was just harder to focus) and seeing the trail became more of a struggle. On top of that my upper body was going through some wicked tightening which was forcing me to hunch forward and to the right. I stopped to stretch at one point but it didn't seem to help much. I would tell myself to stand tall as I ran, push out my chest and bring my shoulders down and back. This would last for about 10 steps before I could feel my body closing up and tilting right again. Over and over I would try to get back into alignment and run smoothly but nothing was really sticking. The legs still felt good and for that reason alone I was able to keep moving forward. Eventually I got closer and closer and could see the JJ finish lights not too far away. 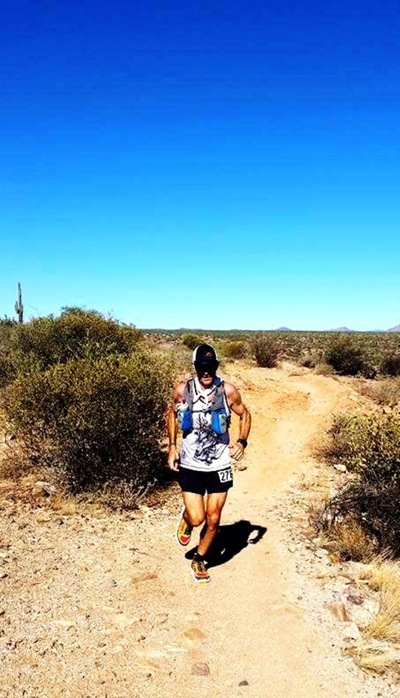 A final burst of adrenaline helped for the final few hundred meters and several sharp turns before heading across the finish line with 20 hours and 20 minutes on the clock. Definitely battled some issues out there but deeply pleased with being able to press on as best I could. 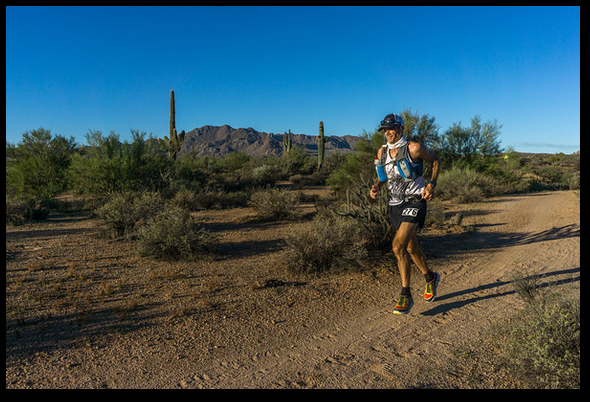 101 miles is a long way but by taking it step by step, mile by mile the unimaginable becomes manageable; the impossible, doable. 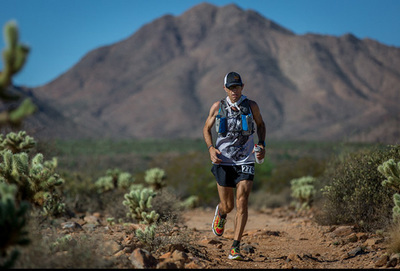 I'm constantly amazed at the incredible athletes that make this distance look easy but know they all go through tough patches and have good and bad days. I'm still trying to figure out all the pieces to the puzzle and will continue to work on fine tuning my training, nutrition and race day execution. Thanks for reading and providing support along the way. PR of one hour, 19 minutes over last year's time. Gear: Pearl Izumi shorts and wool socks. INKnBurn singlet. Tailwind nutrition. Hoka Challenger ATR shoes. Trail Toes anti-friction foot and body cream. Ultimate Hydration Vest. L'eau-Go hand helds.